If it is Saturday, it must mean hockey. The Washington Capitals continue their season-long six game home stand on Saturday night when they host the Florida Panthers at Capital One Arena. This will be the 10th Saturday night game for the Capitals this season, their fifth on home ice, where they are 1-1-2 in such games (5-0-0 in Saturday road games). The Caps will be facing a team that looks a lot like themselves in terms of their performance in the new year. The Panthers started the 2019 portion of their schedule with a seven-game losing streak (0-5-2); the Caps had a seven-game slump of their own in January (0-5-2). Washington has won three of four since that losing streak and will look to extend their current winning streak to three, while Florida has won five of seven since their losing streak. Florida has not lit up the scoreboard like a pinball machine over their recent seven-game run, but they have clamped down on opponents, outscoring them by a 22-15 margin. Four of those goals scored have come from an unlikely source. Frank Vatrano is one of those “unheralded player makes good” stories. Undrafted as an amateur, he was signed as a free agent by his home state Boston Bruins (he was born in East Longmeadow, MA) out of the University of Massachusetts in March 2015. He worked his way into the Bruin lineup the following November and scored eight goals in 39 games as a rookie. However, between injuries and a series of reassignments and recalls, he never found a consistent spot in the Bruin lineup. In February 2018 he was traded to Florida for a third-round draft pick. He has found a home, not to mention a regular spot in the lineup with the Panthers, for whom he has recorded 22 goals in 67 games since the latter stages of last season. In the Panthers’ 5-2-0 run he has four of the team’s 22 goals, and he has seven goals in his last 13 games. In four career games against Washington, Vatrano has yet to record a point and has a “even” rating. Aleksander Barkov is tied with Vatrano for the team lead in points (eight) over this seven-game run. He seems to have cornered the “Byng-Selke” double, having received votes as most gentlemanly player in each of the last three seasons (finishing second in 2016 and third last season), and getting Selke votes as the league’s top defensive forward in each of the last four seasons (finishing fourth last season). His Selke finish last season was, no doubt, buoyed by his league-leading five shorthanded goals. Something else of note about his performance last season, he cast off any shyness when it came to shooting the puck. His 256 shots on goal ranked 19th in the league, but more than that, it was an almost 50 percent increase in shot volume from his previous high (171 shots on goal in 2015-2016). His shots on goal are off by almost a shot on goal per game this season, but his efficiency is up (to 15.0 percent from 10.5 percent last season). Barkov is 3-6-9, plus-3, in 13 career games against the Capitals. Nine players in NHL history have appeared in 700 or more consecutive games at some point in their careers. Three of those players have active streaks. Defenseman Keith Yandle tops that active group with 767 straight games played since his last absence from the lineup (March 22, 2009 with the Arizona Coyotes). Since he started that streak, Yandle leads the league’s defensemen in games played (767), is second in assists (382, to Erik Karlsson’s 432), third in points (465), and second in power play points (209, to Karlsson’s 213). In one of the odd ironies that pop up if you wait long enough, Yandle is playing for a club that passed on him in the 2005 draft one pick before he was taken in the fourth round by the Coyotes. Florida picked defenseman Matt Duffy with the 104th overall pick before Yandle went with the 105th pick. Duffy never played a game in the NHL and last played pro hockey in 2014-2015 with the Quad-City Mallards of the ECHL. Yandle, who will not turn 33 years old until next September, looks as if he will be going on for some time to come. In 23 career games against the Caps, Yandle is 1-13-14, minus-2. 1. Only the Ottawa Senators, among Eastern Conference teams, have allowed more goals on the road this season (113) than the Panthers (103). 2. Florida has the second-worst save percentage in the league on the road at 5-on-5 (.885). Only San Jose is worse (.882). At the other end, their shooting percentage in road games (6.6) is fifth-worst in the league. 3. The Panthers are one of two NHL teams that have yet to allow 40 shots on goal in a road game. Vancouver is the other. 4. Being loose with the puck is a feature of Panther road games. Their 322 giveaways is most in the league on the road. 5. The Panthers do not put themselves a man short often on the road and do not spend a lot of time killing penalties. Their 75 shorthanded situations faced on the road is fourth-fewest in the league, and only Ottawa and Toronto have spent less time shorthanded (108:58 and 115:42, respectively) than Florida (117:53). 1. About that shorthanded ice time. The Caps have spent more time killing penalties on home ice than any other team (158:37). And, their 97 shorthanded situations faced on home ice are most in the league. 2. On the other hand, the Caps have had 101 power play chances at home, second in the league (Nashville has 102). And, their time with the man advantage at home (170:04) is second to Nashville (173:22). 3. John Carlson has more points on home ice this season (27) than the other seven defensemen to dress combined (26). 4. Only Ottawa, among Eastern Conference teams, has allowed more shots on goal on home ice (1,008) than the Caps (949). 5. The Caps can get slopping obeying the rule book. They have been charged ten or more penalty minutes in 21 games this season. Only Edmonton and Philadelphia have done so more often (22 times apiece). If Roberto Luongo gets the nod on Saturday, he will be appearing in his 1,029th career game, tying Patrick Roy for second place in games played by a goaltender in NHL history, with only Martin Brodeur ahead of him (1,266). He stands almost 200 games ahead of his nearest active pursuer in games played – Henrik Lundqvist (843) – and is the active leader in wins (482), losses (380), extra time losses and ties (120), goals against (2,468, the only active goalie with more than 2,000), shots against (30,448, the only goalie with more than 25,000), saves (27,980, the only goalie with more than 25,000). Despite the volume of rubber faced, Luongo is third among active goalies in save percentage (.919), trailing only Ben Bishop (.919) and Tuukka Rask (.922). His 77 shutouts leads all active goaltenders (77), and he has played almost 10,000 more minutes (58,976) than the next active goalie in line (Lundqvist: 49,381). More recently, he has improved of late after stumbling out of the Christmas break. After going 0-4-0 (one no decision), 4.85, .832 in five appearances to end December and open January, Luongo is 3-2-0, 2.19, .921, in his last five appearances. What Luongo has not yet done is win a game on the road in 2019 (0-4-0). It has been an issue for Luongo. Among 32 goalies with at least 750 road minutes played, Luongo is 31st in goals against average (3.78) and last in save percentage (.881). In 39 career games against the Caps, he is 21-12-3, 2.38, .924, with two shutouts. Player A is defenseman Christian Djoos, while Player B is Jonas Siegenthaler. Djoos has been out since mid-December with a leg injury in his sophomore season, while Siegenthaler has appeared in all of his games as a rookie since early November (20 of his 25 total since Djoos went out of the lineup). Djoos is about to return to the club, and a decision is going to have to be made at some point who gets a sweater in Washington, who gets one in Hershey, or if the Caps carry eight defensemen. 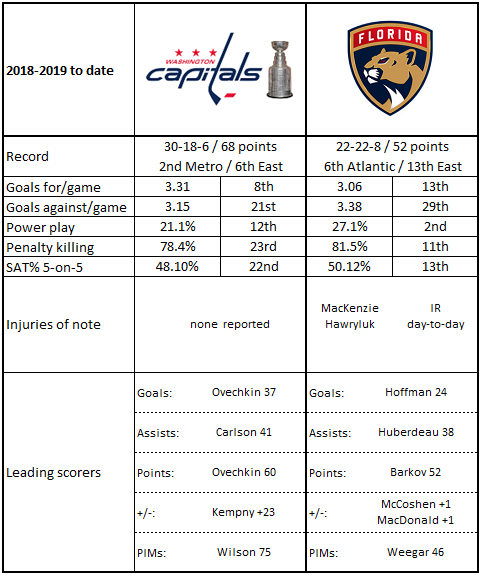 It will not be easy, given that neither have been a noteworthy liability, the Caps with a 16-9-3 record with Djoos in the lineup (5-2-1 when he skated at least 14 minutes) and a 14-8-3 record with Siegenthaler in the lineup (8-3-1 when he skated at least 14 minutes). According to capfriendly.com, the Caps have less than $500,000 in current cap space, so salary management is going to play a role here, as is the fact that Djoos is not waiver-eligible. Even as it seems likely Siegenthaler will be the player left standing in the game of Musical Chairs, his time in Hershey could be brief. Not all the action at this time of year is on the ice. UPDATE: Siegenthaler has been re-assigned to the Hershey Bears. These teams are at similar places in terms of recent performance. What this game might turn on is the venue. While the Caps have struggled at times on home ice this season, they are tied with Nashville for the eighth-most points earned on home ice this season (36). Meanwhile, Florida has the fifth-worst road record in the league. Another reason why the Caps need to make hay while the sun shines on this long home stand.